The Russian president is well-known for his love of animals, especially dogs. 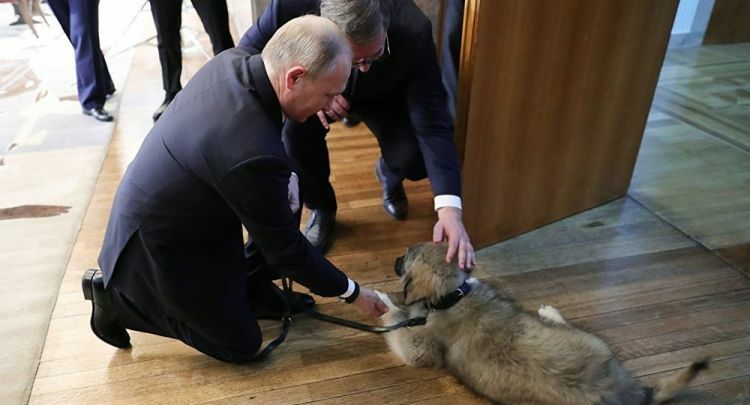 Serbian President Aleksandar Vucic has presented Russian President Vladimir Putin with a four-month-old Sarplaninac, also known as a Yugoslavian Shepherd Dog, during Putin's visit to Serbia on Thursday. Known for its impressive size, resistence to cold, and fearlessness against wolves and bears, the breed comes from the Sar Mountains, located in the southern part of the autonomous Serbian province of Kosovo, where such dogs have been used by shepherds to protect herds of domesticated animals for many centuries. Serbian media stressed that the Sarplaninac gifted to Putin has a very serious pedigree. "Vuchic has presented Putin with Pasha – a Sarplaninac puppy. A smart and loyal dog, but with a stubborn character. When it grows up, it will weigh up to 40 kilograms." The Russian president is well-known for his love of animals. Last year, Turkmenistan President Gurbanguly Berdimuhamedow presented Putin with a Central Asian Shepherd puppy named Verny (the Russian word for 'Loyal'). Pasha will join Putin's other dogs, including Verny, as well as Buffy, a Bulgarian Shepherd gifted to Putin by Bulgarian Prime Minister Boyko Borisov, and Yume, an Akita Inu presented to him by the head of Japan's Akita prefecture as a thank you gift for Russia's help following Japan's devastating 2011 earthquake and tsunami.